It’s Amazon Prime Day 2018. That means customers subscribed to the retailing overlord’s premiere service can get a little bit of money slashed off of things they don’t really want. Well, that’s not entirely true; there are actually some pretty decent offers in the VR space this year that we should point out. We’ll update this page with new deals as they go live throughout the day, but there’s already some stuff you should definitely be interested in. Deals expire tomorrow at midnight local time. This is actually a pretty excellent deal for anyone that hasn’t picked up a PSVR headset yet. For £230, which is what Amazon usually charges for the base headset alone, you also get the PlayStation Camera needed to track the device, a digital copy of entertaining minigame collection, PlayStation VR Worlds, and two Move motion controllers. The last two are a great addition, as they’re usually priced around £60 and are essential for many of PSVR’s better titles. Of course, you’ll actually need a PlayStation 4 console to run your PSVR. Amazon has you covered there, too, with two really good deals on the two different types of PS4 consoles out there. The base PS4 can run any PSVR title no questions asked, but the £299.99 Pro model will ensure better performance and visuals on many of them, too. Personally, we’d go Pro. 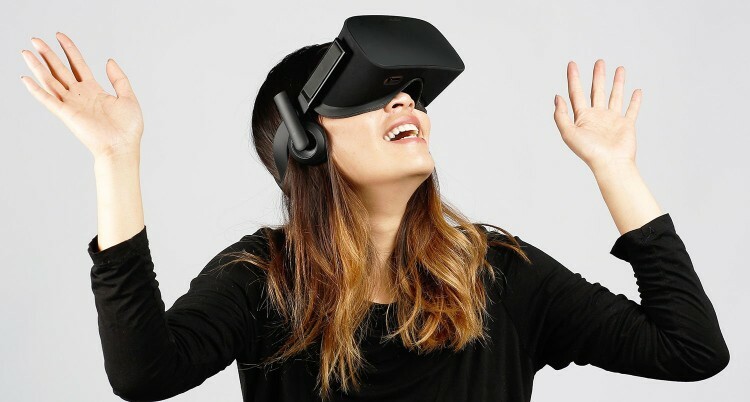 Unsurprisingly Oculus has slashed another £50 off of the price of its premiere VR headset for Prime Day. £349 now gets you the Rift, two Touch controllers and two sensors to track them with. That’s everything you need to get into PC VR beside, y’know, a PC. The post Amazon Prime Day 2018: PSVR With Free Move Controllers, Oculus Rift For Less appeared first on UploadVR. It’s always nice to see VR apps that look genuinely new, and Thalu: Dreamtime is Now certainly seems fresh. This new VR experience from Frame VR will be on display at the Melbourne International Film Festival next month. It’s a piece that brings you closer to the lives of director Tyson Mowarin’s people, the Ngarluma, an indigenous group living in the western Pilbara area of the country. In the experience, a guide will take you on a tour of the spirit world where you’ll encounter lush, surrealist visuals and unique interactive elements. Expect to encounter talking clouds, spiritual boomerangs and the blazing hot Australian landscape. The app’s art was created by Sutu, the artist behind the Mind at War experience we saw at last month’s Sheffield Doc/Fest. We haven’t seen the app for ourselves but it’s hard not to fall in love with the art style or the simple prospect of experiencing a world unlike anything we’ve ever seen before in VR. Listings of when and where to catch Thalu can be found here. As the trailer above suggests, the app should also be arriving on the HTC Vive via Viveport in the near future. The post Thalu: Dreamtime Is Now Is A Surreal VR App Exploring Australian Culture appeared first on UploadVR. Experiencing The Thrill Of Being A Spy In Defector VRFocus get hands-on with Twisted Pixel's upcoming Oculus exclusive spy thriller. Owlchemy Labs’ Rick and Morty: Virtual Rick-ality Nominated for an Emmy It's up against some stiff competition. The PSVR version of one of our favorite VR games of the year so far is nearly here. Finland-based 3rd Eye Studios this weekend confirmed that its VR space odyssey, Downward Spiral: Horus Station, will arrive on Sony’s headset sometime in August. Writing in a blog post, the studio noted the console version was “in the final stages of certifications” with a few last bugs to fix. We didn’t get a specific day, but it’s great to hear the PSVR version isn’t too far around the corner. Downward Spiral sees players awaken on a seemingly deserted space station, which they must then explore in search of the missing crew. The game uses zero gravity traversal, getting players to grab onto surfaces and then launch themselves into the air. It also includes a full campaign that can be played in either single-player or with a friend in co-op as well as competitive multiplayer modes to boot. VR support is optional and support for both the DualShock 4 and Move controllers is included. The post Downward Spiral’s PSVR Version Is Releasing Very Soon appeared first on UploadVR. Beat Saber to Feature PlayStation VR Exclusive Features Plus PlayStation 4 Pro will be supported. Sign-up to the Third VR Diversity Initiative The event will be held on Tuesday the 31st of July at Plexal City. Life In 360°: Remote Control Menace SoKrispyMedia take to VR for the first of three 360 degree shorts. The post Rick And Morty: Virtual Rick-ality Nominated For Primetime Emmy appeared first on VRScout. Showpad Releases AR Feature To Help Make Sales Pitches More Immersive Now available on iOS. Edmunds Bring Their Can It Fit AR Feature To Android Now Android users can use augmented reality to see if a car fits in their driveway. Amazon Opens VR Kiosks In India To Promote Prime Day Sale The company will start selling HTC Viveport apps soon as well. Krikey Teams Up With Van Leeuwen To Release New Ice Cream-Themed AR Experience All in celebration of Van Leeuwen's tenth anniversary. The VR Job Hub: The World Cup Is Ending But The Jobs Are Not A variety of exciting positions available around the world for those looking to find their dream job. Something For The Weekend: Sunny Day Deals On Steam Go on adventures both under the waves and above them in a number of exciting VR titles on sale this weekend.